August 2012 – Valentina E.
Valentina E. For The Summer Harvest Hunt! We’re thrilled to be participating in The Ego Co.’s Summer Harvest Hunt, starting September 1st. Find this pretty ‘Bird’ dress and matching hat in our store. Just look for the little acorn. It’s all mesh of course. Happy Hunting! Just out, our brand new Strapless Bow dress in striped and plaid finished. Find both in four different colors. Valentina E. Joins Lazy Sunday! We are thrilled to be a part of Lazy Sundays in Second Life! This pretty strapless mesh dress with bow will be available this Sunday, August 26th, for just 75 L! Don’t miss it! Valentina E. For Collabor88 August! 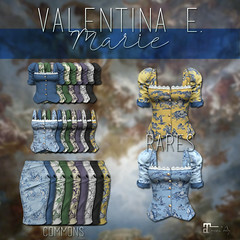 Valentina E. is thrilled to be a part of the one year anniversary round at Collabor88! Here’s our exclusive offering. This stylish ‘Baroque Shell’ dress includes a separate bra insert and fascinator. Available in four colors, this exclusive design can only be found at Collabor88 during the month of August. Don’t miss it! 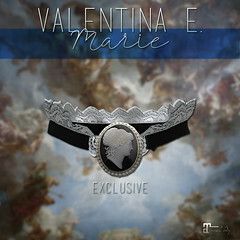 Valentina E. Vintage Fair Exclusives!